Sunday was my birthday, and I was fortunate enough to get to spend several hours with my camera and tripod in downtown Phoenix. The hubby went along with me, and he carried my backpack with extra lenses and assorted paraphernalia, leaving me free to climb stairs and low concrete walls to get the shots I wanted. Ordinarily I wouldn’t choose to shoot downtown in the middle of the day since the shadows can be so harsh. But I knew I was going to process these shots as HDR’s, so I decided to take advantage of a beautiful, if still warm, autumn day when downtown was pretty much deserted. 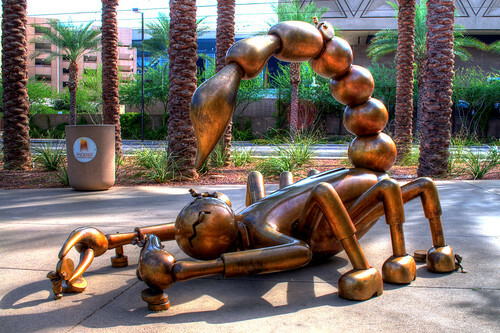 Three large, whimsical bronze sculptures of desert creatures, enlarged to human scale. The creatures include a millipede with a hat and shoes; a walking stick in high heels, and a scorpion holding two small men in top hats tugging at a bag of money. Accompanying sculptural elements of people, scaled down to Lilliputian dimensions, interact with the creatures. The sculptures are set in a unique water-harvesting garden at the public plaza located near the southeast entrance of the North Building. Each of these images was created from a bracketed series of three photos (-2.0/0.0/+2.0) taken with my Nikon D5000 and the kit lens (18-55mm 1:3.5-5.6) at F/13. I used Photomatix Pro v3 to produce the HDR image, and then post-processed in Paintshop Pro X3 to tweak the brightness and contrast, and I used the Curves tool to modify the color balance slightly. 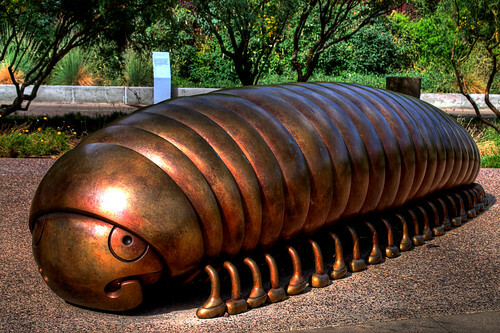 I like the way that the HDR process accentuates the variations in the shades of bronze on the sculptures, especially on the millipede. My biggest disappointment was on the scorpion–once again I have a little flare spot in the middle of the picture. I need to figure out where that’s coming from so I can get rid of it. The majority of the other images that i took are architectural in nature, and I’ll be posting them in the next few days and weeks. This coming weekend we’re planning a trip into Oak Creek Canyon north of Sedona to check out the fall color (if there is any yet). I’m looking forward to getting my camera out in some cooler weather–it was over 90° in downtown Phoenix when these shots were taken yesterday. Way too hot for late October!! 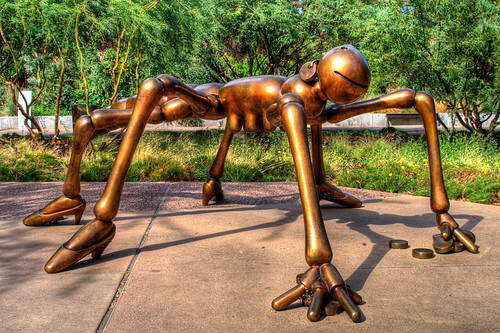 This entry was posted in Information, Processing, Shooting and tagged animal, Arizona, AZ, bronze, camera, convention center, D5000, HDR, Nikon, Paint Shop Pro, Phoenix, photography, Photomatix, sculpture, software, Tom Otterness, tripod. Bookmark the permalink. Awesome shots! Looks like some fun sculptures to shoot. Might have to pay a visit to downtown soon. great stuff, suzanne……i think i need to see them upfront myself….thanks for the info….